As growing companies begin expanding into new rooms and buildings, they often need help organizing and dividing those spaces. Versare offers a diverse selection of office partitions and portable walls, and our sales team is available to help choose the perfect setup for any business. Because of Versare’s excellent selection, fabulous prices, and hands-on customer service, CRC came to us for help finding a solution. They told us that the ceilings in the new room were extremely high. But because they wanted to preserve the space’s openness, they didn’t want portable walls that were too tall. They also wanted a sound-absorbing partition, but asked for a window at the top to maximize the flow of light in the room. And the vast size of the space dictated a wall that could traverse a large area. After consulting with our client, Versare designed the perfect solution to their problem. We decided that the Operable Wall was the best fit because of its massive size. Reaching lengths of up to 15’7”—which can be doubled to 31’ when you combine two—the Operable Wall is a great choice when you need a room divider covers more space. Available in sliding and folding varieties, the Operable Wall can also reach heights of up to 12’, making it great for warehouses, gymnasiums, auditoriums, and other large spaces. The sliding option is a telescoping partition (like a supersize version of our StraightWall), with panels that easily slide out to any length needed, while the folding version quickly unfolds and can be shaped into a straight line, “L” shape, “C” shape, and more. Both versions feature an articulating, flexible hinge system that allows them to easily traverse uneven flooring. CRC chose the Operable Wall Sliding Room Divider, and they requested an upgrade to custom polycarbonate windows at the top (an option not normally available, but we go the extra mile). 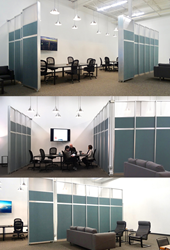 With a little ingenuity, our team was able to divide the space with three Operable Walls. We attached one unit to each side of a pylon in the room, then another to a wall on the opposite side of the room. Thus, the client could now create a sitting area, one large conference room, or two smaller conference rooms, all within minutes.